The discovery the that phenolic glycolip-id (PGL-I) from Mycobacterium leprae (3) was a species-specific antigen (4,9) was one of the most important discoveries made in the last decade in the field of mycobacterial diseases, and it stimulated the already successful search for species-specific glycolipid antigens in other important human pathogens, notably M. tuberculosis (1,2,5). Although many studies were devoted to the PGL-I antigen (reviewed in 2) and reasonable correlation was established between anti-PGL-I antibody titers and bacterial loads (bacterial index, BI 7), to our knowledge an investigation to verify if there were quantitative relationships between antibody titers and the intensity of lepromin reactions has escaped the attention of previous workers. For the purpose of this study, sera were collected from 53 first-time leprosy patients. After the blood was collected, 0.1 ml of lepromin-H was injected intradermally and the lepromin reaction was measured as millimeters of induration 21 days later. The patients were subsequently classified according to the Ridley-Jopling scheme (6). The sera were tested using ELISA, and IgG and IgM levels were scored as the absor-bance obtained using a 1/250 dilution; the ELISA method was as described before (1). The lepromin test, ELISA, and the classification of the patients according to the Ridley-Jopling scheme were done blind by independent workers. The quantitative relationships between the anti-PGL-I antibody levels and the lepromin reaction are shown in The Figure. The data neatly divided the patient population into three major groups: a) patients with a negative lepromin test (0-2 mm induration but antibody levels above 500); b) patients with a positive lepromin test (more than 6 mm of induration and antibody levels less than 150); and c) patients in an intermediate position in the two scales (either lepromin negative but with antibody levels below 500; or lepromin reactions between 3 and 6 mm with antibody levels below 150; or lepromin reactions between 3 and 6 mm with levels between 150 and 500). from the practical point of view it would therefore appear that the first category of cases were the truly lepromin-negative (LL cases), the second category were the truly lepromin-positive (TT cases), and the third category (intermediate) should include all borderline leprosy cases. The figure. 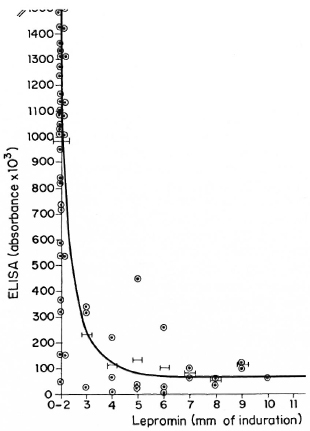 Quantitative relationships between ELISA (absorbance x 103) and the lepromin reaction (mm of induration). When the patients classified according to the Ridley-Jopling scheme were arranged in respect to the corresponding lepromin/ ELISA data (The Table), good agreement was found between the two classifications. Therefore, the neat and simple quantitative relationship found in this study indicates that anti-PGL-I antibody assays may be useful for the classification of leprosy. from the immunological point of view, the data indicate that M. leprae antigens must be equally well processed by macrophages at both ends of the leprosy spectrum, which contradicts the generally accepted hypothesis that macrophages in lepromatous patients carry a M. leprae-specific defect (reviewed in 8). We propose that the simplest explanation to the observed relationship is to hypothesize that for each B-cell clone there must be a corresponding T-cell clone, their ratio being strictly regulated, and that during the protracted subclinical disease whichever of the clones is primed to proliferate the other must be repressed. Finally, from the viewpoint of serodiag-nosis, the observed relationship supports a previous conclusion (2) according to which the sensitivity of serological diagnosis in tuberculosis and leprosy using purified species-specific antigens must be necessarily low since it is dependent upon the immuno-pathogenesis in these mycobacterial diseases. - Hugo L. David, M.D., Ph.D.
- Maria de Fátima Maroja, M.D. Acknowledgment. We thank Dr. F. Papa (Unité de la Tuberculose et des Mycobactéries, Institut Pasteur) for supplying the PGL-I antigen; to Dr. A. T. Orsi-Souza (Instituto de Dermatologia c Venereologia Alfredo de Matta) for supplying lepromin-H; and the colleagues and nurses of the Instituto de Dermatologia c Venereologia Alfredo da Matta for their invaluable help in the classification and monitoring of the patients. 1. Cruaud, P., Yamashita, J. T., Martin-Casbona, N., Papa, F. and David, H. L. Evaluation of a novel 2, 3-diacyl-trehalosc-2' sulfate for case finding and diagnosis of leprosy and tuberculosis. Res. Microbiol. 141(1990)679-694. 2. David, H. L. The spectrum of tuberculosis and leprosy; what can be the significance of specific humoral responses? Res. Microbiol. 141(1990)197- 206, 263-265. 3. Hunter, S. W. and Brennan, P. J. A novel phenolic glycolipid from Mycobacterium leprae possibly involved in immunogenicity and pathogenicity. J. Bacteriol. 147(1981)728-735. 4. Hunter, S. W., Fujiware, T. and Brennan, P. Structure and antigenicity of the major specific glycolipid antigen of Mycobacterium leprae. J. Biol. Chem. 257(1982)15072-15078. 5. Papa, F., Cruaud, P. and David, H. L. Antigenicity and specificity of selected glycolipid fractions from Mycobacterium tuberculosis. Res. Microbiol. 140(1989)569-578. 6. Ridley, D. S. and Joping, W. H. Classification of leprosy according to immunity; a five-group system. Int. J. Lepr. 34(1966)255-273. 7. Schwerer, B., Meeker, H. C, Sersen, G. and Levis, W. R. IgM antibodies against phenolic gly-colipid-I from Mycobacterium leprae in leprosy; relationship to bacterial index and erythema nodosum leprosum. Acta Leprol. (Geneve) 95(1984)395402. 8. Shepard, C. C. Immunity to leprosy and the Mitsuda reaction. Int. J. Lepr. 52(1984)74-77.